Viking-/Black-Metal from Portugal. Best of compilation Tape. 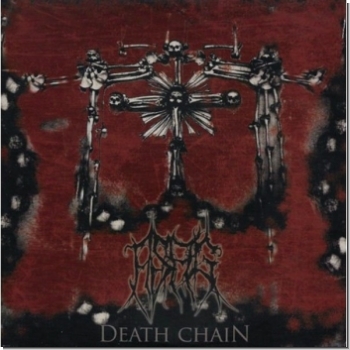 First LP is the new CD "Blood for the Blood God"
Death Altar / Xerión "Invocacións no Altar da Morte"
Split Tape. Black-Metal. Limited Edition of 66 copies. Rehearsal Aufnahmen 2000-2003. Dracula radio-play. Forest of Doom / Xerión "Split LP"
Forest Of Doom (Cold Black Metal from Mexican lands) and Xerión (Galician Extreme Metal), limited to 210 handnumbered copies with a fantastic cover by Igor Mugerza. Koltum / Xerión "Split Tape - Live"
Split MC. Live Tracks 2012. Split LP. Succubus "The Source of the Blood Dominion" und Maggots "Burn your church". Black-Death-Metal. True Norwegian Black-Metal. Limited LP in three versions. White, 166 limited copies. Raw Black-Metal / Celtic-/Black-Metal. Split Tape (MC). Xerión "Escarnio, maldizer e Morte"
Celtic-/Black-Metal. Limited Edition of 100 copies.